Popova I.F. Political Practice and Ideology of Early T'ang China [Политическая практика и идеология раннетанского Китая]. 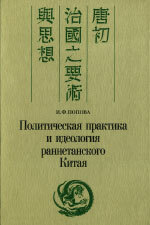 Moscow, Vostochnaya Literatura Publishers 1999. 279 p.
On December 4-6, 2017, the Annual IOM Academic Session The Written Heritage of the Orient as the Basis for Classical Tradition of Oriental Studies will be held.